This week we jump back in time to 1981 in Dublin . 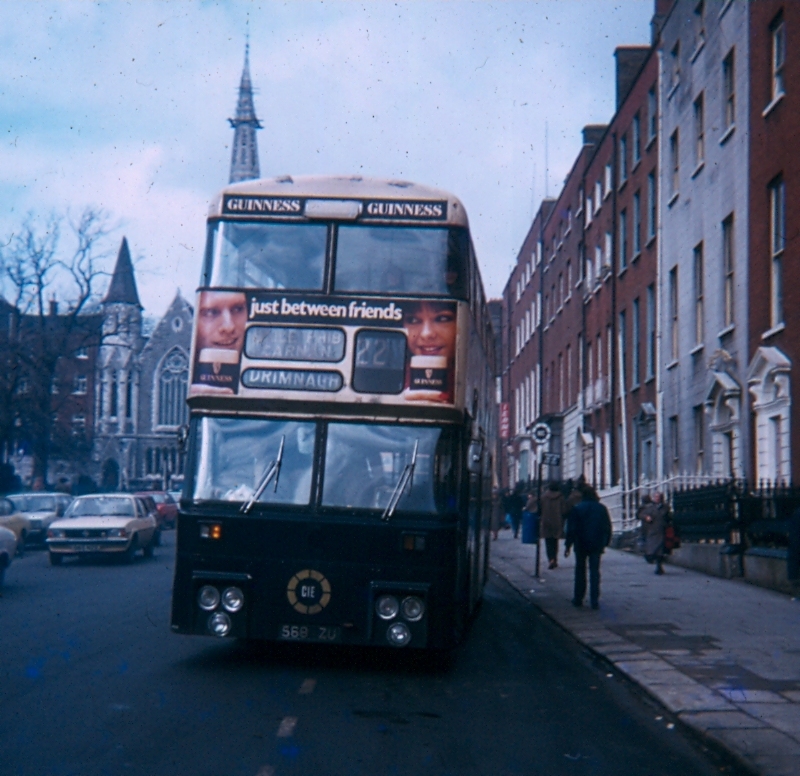 ..
Off all of the changes of livery on the Dublin bus scene over the years, possibly one of the slowest was the move away from the blue & cream livery for double-deckers, and into allover tan, fleetwide. The first new buses in tan (orange) arrived in late 1974 (the VanHool AN68 Atlanteans) and by early 1975 repaints of the 602 earlier PDR1 Atlanteans had started. But the repainting, which coincided with BMS full body overhauls at Inchicore Railway Works, was very slow paced, unlike today, when the entire fleet is repainted on a three-year cycle. By the time that the last D in Dublin was repainted into tan, there were already hundreds of KD-class Bombardiers on the road in the new two-tone green livery, so the tan never wholly ruled the roost. There were blue & cream halfcabs (PD3s) on the road until April 1982, and the last handful of Ds in the old livery lasted a few months beyond that in Dublin (and even longer in provincial cities). 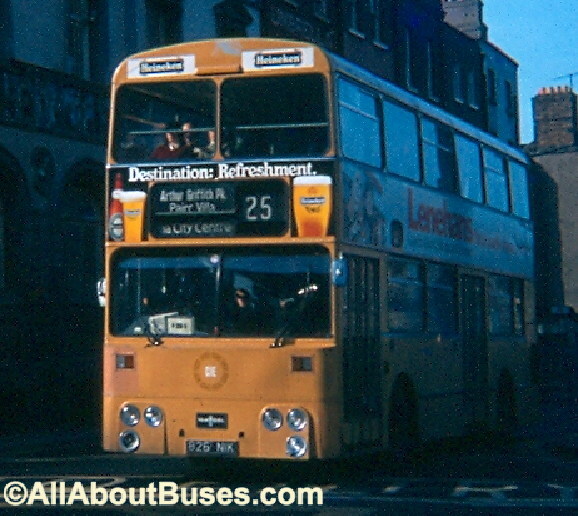 D568 was one of the last to wear the old livery in Dublin, and is seen here in 1981, about a year before it finally got an overhaul and repaint. At this point, the bus was 7 years old, but the blue & cream was very effective at hiding wear and tear and everyday scuffs (whereas the new tan livery tended to age quickly and look tired after a short period). As one off the final batch of PDR1s, this bus was delivered in the final version of the blue & cream, without the between decks stripe (new buses from D555 onwards did not have it, and many earlier buses lost it on repaint if they were lucky enough to have a blue & cream overhaul/repaint before the dreadful tan became standard). Throughout this time, D568 spent pretty much all of its time on the 22 route, and it can be seen that 7 years marked in on the same route has faded the destination blinds to the point that they are almost unreadable. The intermediate blind is correctly set for BAILE PHIB / CARNAN and as this blind served both directions, it was the most faded of the lot, as the ultimate destinations were at least only displayed 505 of the time, while the journeys would also alternate between 22 and 22A frequently, helping preserve the number blind. If this bus had been visiting any other route on the day of this picture, the blinds would probably have been crisp and white! This week we jump back in time to 1979 in Dublin. The bus displaying it here is D826, one of the final batch of VanHool MacArdle bodied Leyland Atlantean AN68s delivered to CIE in 1977/78, following a gap in production as the Spa Road plant built double-deckers for South Yorkshire and A1 Motor Services. 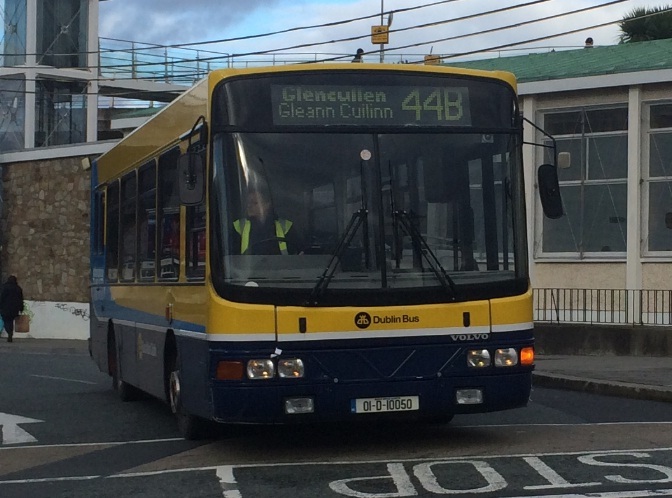 These last Dublin-built buses differed from the earlier VanHools in having a revised lower frontal section made of fibreglass, and also originally sported the more modern square VanHool badge. Over the years they gradually lost these features, and ended up identical to the bulk of the VanHool fleet, which had been delivered between 1974 and 1976. 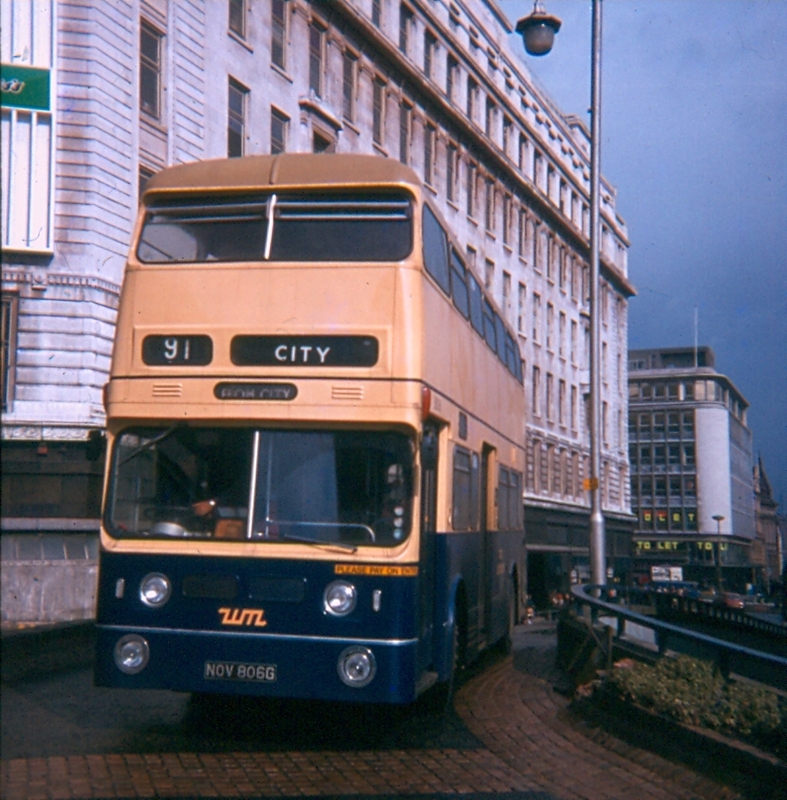 D826 is seen here heading inbound on the south quays (in the days before the traffic flow was reversed) and with a hopelessly mis-set destination display, the top blind being halfway between the outbound route 25 and 37 displays, and the lower displaying “via City Centre” which would be more commonly used on cross city routes – “via Chapelizod” would have been more appropriate for the 25. This week we jump back in time to March 1981, and a pair of shots taken in the centre of Birmingham. Our two photos today date from mid-March 1981, and are taken in Birmingham, close to the city centre. 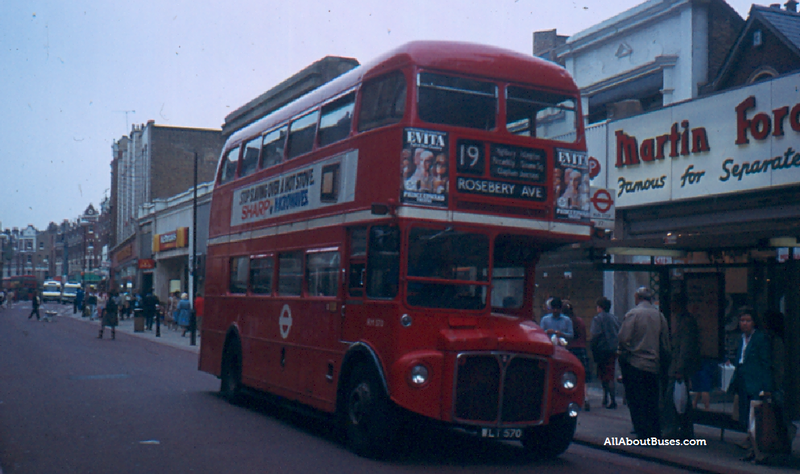 The first shows Park Royal bodied Fleetline NOV806G, new to Birmingham in December 1968, and still in the older Blue & cream with kakhi roof, which served as inspiration for the CIE double-deck livery of the 1960s. The destination display is not the most effective in an area where “City” could refer to any one of the three major parts of the conurbation of Birmingham, Wolverhampton and Voventary – especially as the secondary display reads “from City” !! 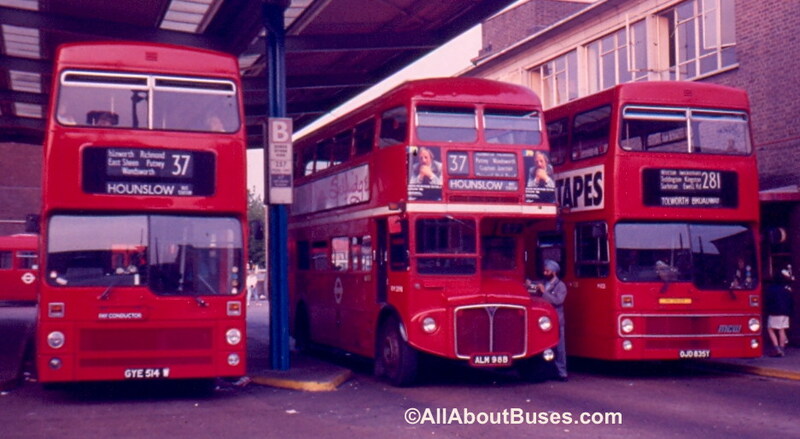 This bus was, at the time, one of the older vehicles in the fleet, and had been withdrawn by the end of 1983. 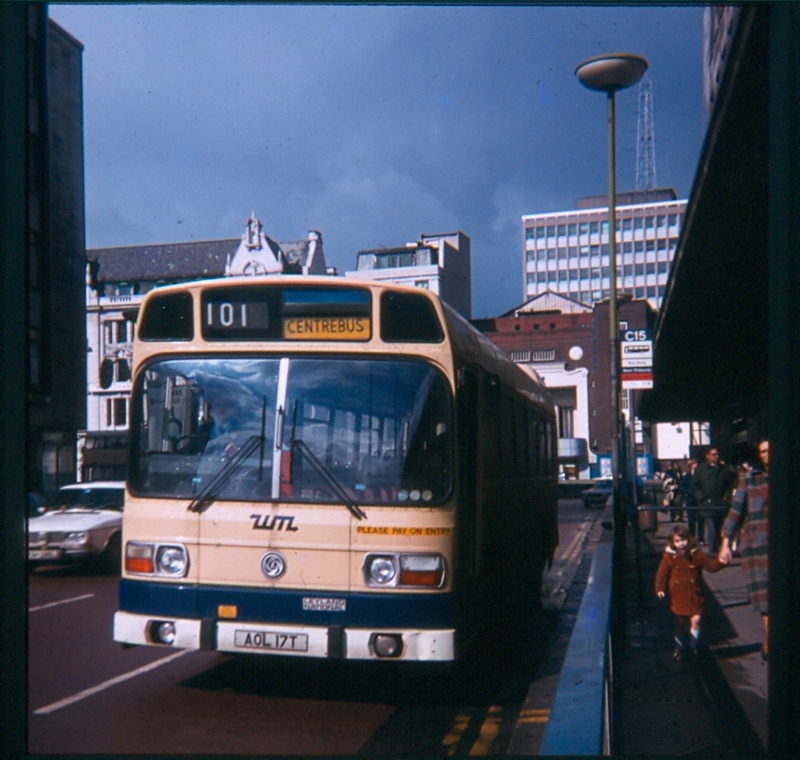 The second photo, taken on the same day, shows the new order, with then fairly new Leyland National AOL17T on the 101 Centrebus service. This National had a long life, being converted to dual-door and used for shuttle work at the International Convention Centre and eventually passing on to a fringe London operator, where it was still active in 2001.